Hello folks, in today’s tutorial, I will show you how to use Font Awesome in WordPress. By the time your are finished with this tutorial you will be able to add icons to your navigation menu, posts and pages. little more by adding these icons. Once you have navigated to the font awesome website, click on the Get Started link. There are a few different ways to use Font Awesome but the easiest way to get Font Awesome on your website is to use the Font Awesome CDN. 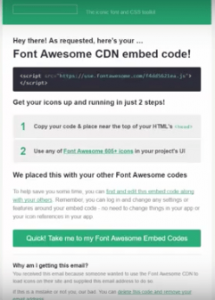 In order to receive a Font Awesome embed code, all you have to do is provide an email address and the embed code will be sent to you. You will receive an email that looks something like this. is handy if you have multiple web sites and want to add some customization. You can also add automatically add accessibility best practices and Asynchornous icon loading. Asynchronous loading prevents the icons from slowing down your pages. Once you are happy with your settings. click on save and move to Step 2. We now have to enqueue Font Awesome into our theme. you should use and how to create a site specific plugin at this link. inspect. You will see an li item and an ID number beside it. Copy the id number and place it in your style.css file as in the above code. Next you have to select an icon. To do this visit fontawesome.io/icons. scroll down and select an icon. You should see a unicode something like \f003. Go ahead and copy the code. Now go back to your style.css file and paste the code so it looks something like the code above. Repeat this for all your menu items. Step 1 and 2 are the same as the steps above, so I won’t repeat them hear again. If you already completed the first steps you do not have to do it again. Let jump right in to our post. make sure you are in the text tab. start by adding an opening and closing “i” tag like so. then add the name of the icon. I will use fa-phone. after the closing “i” tag, I will add a phone number. Repeat this process for any other icons you want to add to your post. Well, that’s it. You now know how to use Font Awesome.